Does it Really Take 30 Minutes to Wake Up? 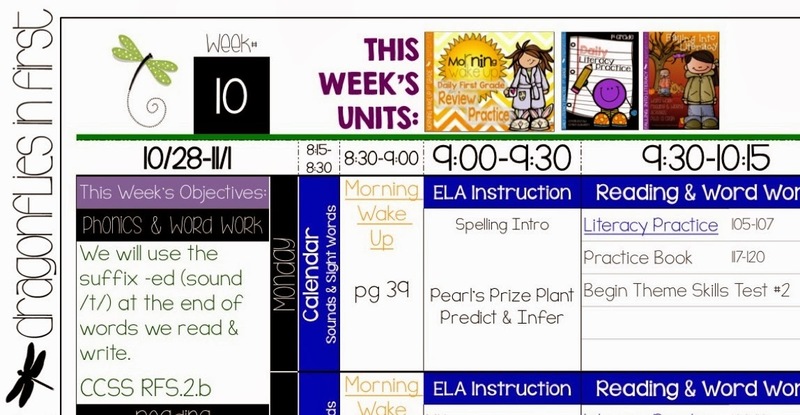 Recently a teacher emailed me asking a few questions about my digital plans I post each week. One of her questions was about my Morning Wake-Up block. My morning work time. Here’s a glimpse of what she was asking about. She asked how I stretched my Morning Wake-Up time to 30 minutes – and what was I doing while the kids were working on this. It gives me an opportunity to share with you one of the greatest things I’ve learned in all my years of teaching … s.l.o.w. d.o.w.n. I don’t mean work slowly.What I mean is – stop making the goal to get through your stack of work you scheduled for the day – but rather make everything meaningful. It wasn’t an easy shift. I’m a task person. I like to check things off. Get things done. Move on. But that is definitely NOT the way to teach. Thorough understanding doesn’t occur that way. No, I don’t mean throw out your schedule! That’s just crazy talk!!! Just make room in it for better teaching. Giving myself permission (and sometimes simply forcing myself) to SLOW DOWN and wring every speck of learning out of each thing we do in class was a fabulous change for me. My first few years of teaching I always stressed about getting everything done and not “falling behind”. One of the biggest and best “shifts” I made in this area was in correcting work. I rarely grade things on my own and pass them back. In my class my kiddos hear a lot of…. In the first weeks of school we go over the rules about the red pens and how to grade/go over your own work. The kids know that skipping ahead, marking something correct when it is actually wrong and just needs to be fixed, will result in a moved tile and a paper that is thrown away. If they get something wrong, they know it is absolutely no big deal however it is a HUGE deal if they don’t fix it when we go over it. Morning Wake-Up – the PERFECT Way to Wake-Up that Schema! Morning Wake Up is a morning work review sheet that we do each day. I’ve had it bound into books that the kids keep in their desks. Here’s one of the pages. Keep in mind that the question content/standards vary a bit throughout the year, but the format remains consistent. Because the pages change only slightly each time, the kids quickly learn how to complete the pages on their own and do so with minimal initial instruction. A finished morning work page would look something like this. They all put away their books and pencils and grab their red pens. But this is the important part. I don’t just tell them the answers and have them mark them right and fix any errors. Each and every day we do a little lesson on each question. I consider it a time where they teach me. Their job is to explain to me why their answer is correct and I do a lot of asking why. A LOT OF ASKING WHY. The first question is my favorite part. 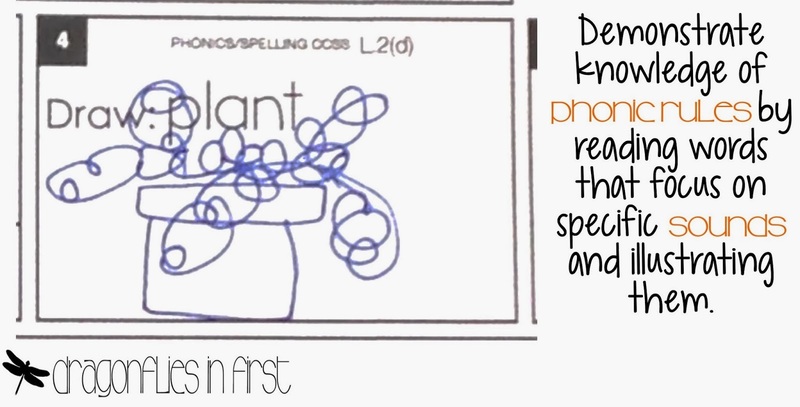 This is truly difficult for many first graders. Quite honestly, most of the time it requires some common sense that a few of them haven’t quite developed yet. Could they be traveling on a road? Sure, people drive places for trips. It never said they weren’t driving. Could they be traveling in a plane? Absolutely, sometimes people fly when they travel. Could they be traveling on the ocean? Yes people go on ships to travel far as well. Ok… so were there any clues to make one answer a BETTER choice than the rest? The point here is that often times there will be more than one possible choice. I encourage the kiddos to search out evidence that will help support the BEST choice. They must give me the reason WHY they chose choice B. 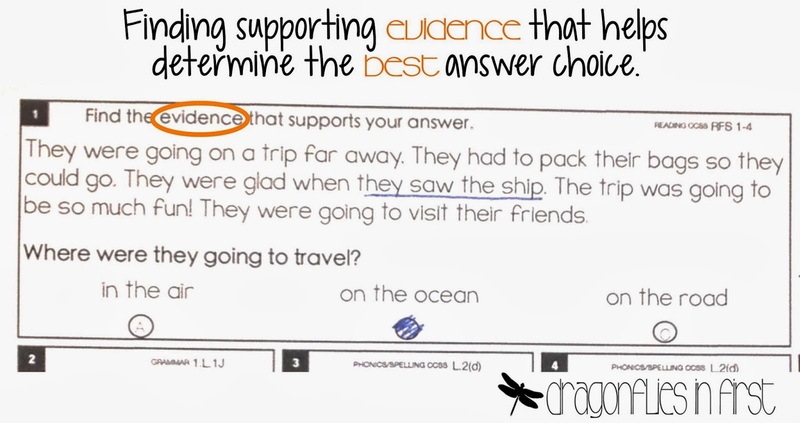 Sometimes using common sense and/or prior knowledge in addition to some evidence they find in the text will supply the reasoning behind their answer choice. This lends VERY well to common core because students must be able to decipher between good or reasonable choices and select what is BEST. 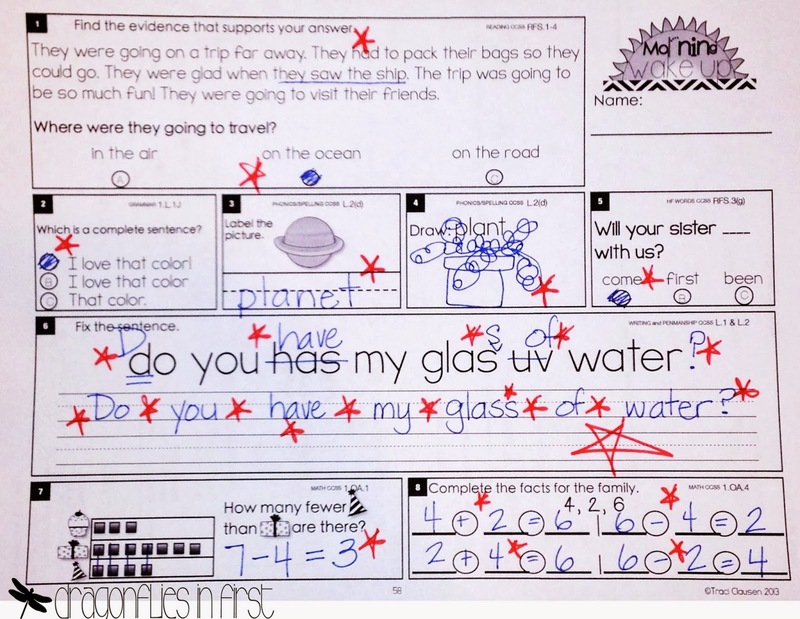 The kiddos know that the main idea of this question is to underline the evidence – not just pick a, b, or c. As the year progresses, the answers to questions in this section get more and more complicated to figure out. Having kiddos explain why something is wrong allows them to engage higher level thinking and demonstrate a more thorough knowledge of a concept. When they CAN’T explain it – I know we have another opportunity for a well needed lesson. This type of question allows us to discuss WHY the name of this picture follows a phonic or spelling rule we’ve learned about. I LOVE to have them explain to me the phonic rule or spelling pattern found in words, rather than ask them to spell or read it correctly. AGAIN… the more they can explain, the higher level their thinking and the greater rules are embedded into their schema. This provides the kiddos with another opportunity to demonstrate their knowledge on sounding out. Editing, sentence construction and penmanship are something we work on constantly throughout each day. 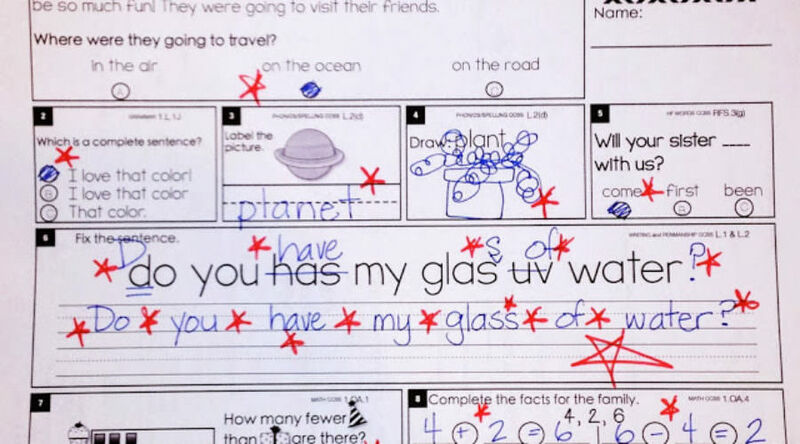 This task may have errors in punctuation, capitals, grammar, and/or spelling. Their job is to find it all – fix it – and then write it correctly using GORGEOUS PRINTING that must include properly formed letters that use the lines and words that have spaces between them. This sample of math is pretty straight forward. 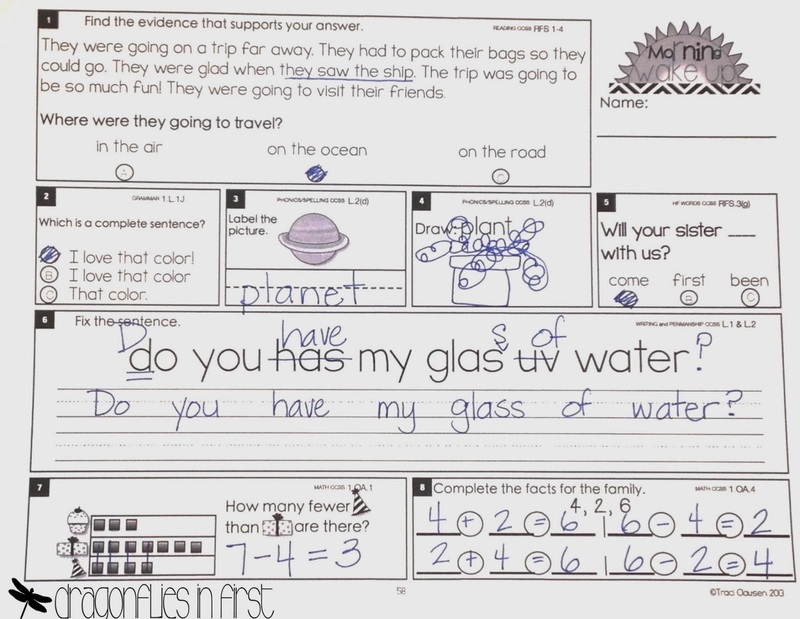 The kiddos know they need to show the complete number sentence for how they found their answers. For example on problem number 7, it would not be acceptable to only write 3. Throughout the time we are “going over” our paper I walk around the classroom and monitor their happy marks. To be honest it only takes 1 or 2 times of someone in class getting their paper thrown in the trash for “cheating and not correcting their paper the right way” along with moving their tile to ensure that the whole class does the right thing. When I first started teaching, it was hard for me to see morning work as anything other than a COLOSSAL WASTE OF TIME. After all, it is review, it should go quick. But I realized that this review was a perfect opportunity for the kiddos to completely consume these concepts. Eat them up, spit them back out, know them upside down, sideways and backwards. AND it helps me identify who knows the concept and who doesn’t while allowing me to immediately address the issue. Realizing I had to make a shift in thinking in order to ensure what we did in class was as meaningful and effective as could be definitely made me a better teacher and definitely helped my students become amazingly successful thinkers! This technique is something I do all day long on most things we do “independently” unless I plan to use the work as a formal assessment. If you feel that stress of getting through it all, I greatly recommend you try telling yourself to slow down and just spend a day doing a lot of asking why. Have your kiddos teach you what they know. You will learn a lot about what they don’t know and what you thought they “got” but really didn’t. If you are nervous about slowing down and letting some things on the plan go – I promise you’ll change your mind after shifting gears for a couple of days. Once you see the shift within your student’s knowledge gain you will be so happy you took the time. Worried your higher level students will be bored? Don’t be. They absolutely LOVE being able to teach a concept back to you. All of my kiddos are seriously incredibly engaged during these “grading” times. 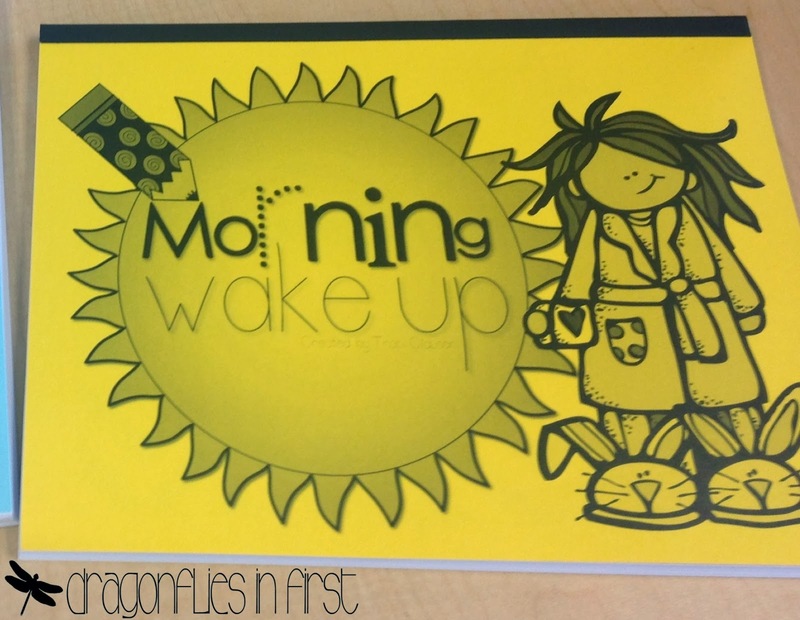 Check out this post for Morning Wake Up for K, 1st and 2nd! Oh WOW!!!! I love this Thank you! This post is just what I needed to hear!! Traci…this is FABULOUS!!! I LOVE your Morning Wake UP packet!!! Thank you, thank you, thank you! This was a very informative post and I really got a lot out of it. I use your Morning Wake Up packet with my son, whom I homeschool. This is our first year (kindergarten), but he is slightly advanced in some areas. Your packet works great for him. Thank you, again, for the hard work you put into this packet, and the time you put into this post, explaining how you go through it, step by step. Awesome! I love this post, Traci! It took me a long time to embrace this form of "checking." You hit it, though! Simply LOVE. THIS. POST! LOVE this post, Traci!!!! Going slow and having kiddos correct their own work has been so powerful in my class, too!!! What a wonderful breakdown of all the reasons why!!! What math and reading series do you use? Our ELA series is a very old Houghton Mifflin product. I basically pick through it to find some useful tidbits. Our math is Houghton Mifflin as well, but it isn't quite as old. 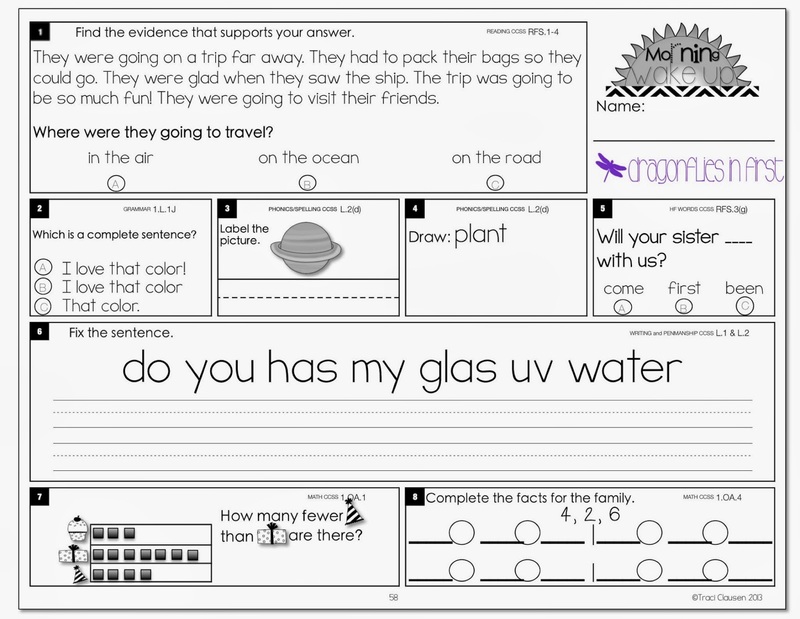 Do you have any suggestions for making something similar for a higher grade level like third or fourth? I love the concept! I'm just curious as to how you got started choosing questions and organizing it.. TIA! Well this really was a huge labor of love. I have K and 2nd in the works and hopefully upper grades after that. What I do is take the KEY standards for the year, map them out in the order in which it makes the most sense to teach them and then introduce, review and spiral each concept for the entire year. I introduce a new concept about once every 5 pages. I have the same philosophy AND the same problem. Thanks for the reminder that it IS important and it IS OKAY to take the time. I find this is when the most learning happens because it is suddenly relevant to them directly. I love this pack and use it daily since November…my only thing is what to do with those kids that continually are never ready to correct. My rule is no pencils in hand only the red when they correct, but then I still have several kids daily that do not feel the need to finish theirs because they'll just write it in red. They are not motivated by the points or the need to stay in recess to finish….any suggestions? Does this happen in your room too? Our Kinder, 1st and 2nd grade teams have them bound in a book that stays in their desks. If I didn't have them in a book, I would send most of them home daily and just keep one here and there for data. Maybe a couple a month. Thanks for purchasing the 2nd grade version!